GVS reports that Jeju congresswoman Jang Ha-Na declared in October that recent independent surveys demonstrate that, “Compared to last year, the soft corals, endangered species in the Gangjeong Sea, are dying from mysterious causes or have stopped growing. It has also been confirmed that floating detritus from the construction is forming deposits in various locations.” Furthermore, she said that the police and prosecutors have unjustly arrested and imprisoned citizen monitors 55 times between January 2012 and September 2013. Catholic Solidarity to Realize the Peace Island, Jeju is a coalition of activist Korean Catholics who came together two years ago. 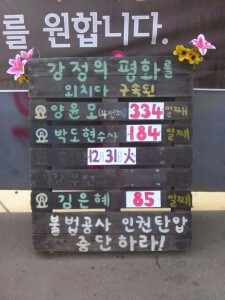 They mobilized what has become a significant pillar of support for the villagers of Gangjeong, who are now in their seventh year of nonviolently resisting construction of a major naval base that is destroying a unique coastal geology and sea coral ecosystem. The group coordinates a daily Catholic communion mass in the road at the main construction gate and the naval base office gate. Mass at the office gate has been disrupted regularly since last spring, and in October, thick lines of police began blocking priests and nuns on their way to worship at this gate. At the main construction gate, supply trucks are stopped for an hour but are impatiently revving their engines by the time most of the celebrants leave the road. Still, every day they must wait for a few priests and nuns who stay seated in their chairs. Police will move in to carry them sedan-style to the side of the road, and sometimes make arrests, so that the trucks can move through again. The September 30 anniversary celebration of this solidarity brought 500 people to the gate, and traffic was stopped all day. Among the visitors were recidivist peace prisoner Fr. Bill “Bix” Bichsel SJ, and Nipponzon Myohoji Buddhist Brother Gilberto Perez, both of the Ground Zero Center for Nonviolent Action in Washington. As he sat in front of the trucks, Bichsel held a sign in English inviting his fellow Jesuit, Pope Francis, to join them. In November, Korean writer Cho Jeong carried the “No naval base in Jeju” message into the Vatican’s St. Peter’s Square with a makeshift sign she displayed beneath the window where the Pope would soon appear. Vatican police quickly demanded she put away the prohibited political message. When she left the Square and continued her picket in Rome, Jeong was arrested, her passport was taken and her sign confiscated. She got the passport back and was released about 20 minutes later. A Korean resident of Italy who was taking photos of Cho was also held for a passport check. As the daily mass/blockades, 100 ritual bows, community meals, and nightly ecumenical celebrations with dance and song continue, so do sessions in Jeju courts and the regular passage of resisters in and out of prison doors. Since the beginning of the resistance in 2007, the newly formed Gangjeong Human Rights Committee reports nearly 650 arrests, resulting in 473 indictments. Many of the cases are now making their way through the courts. In 2013 alone, the local court has heard over 600 cases against hundreds of citizens, issued verdicts for 123 people and levied fines of nearly 250M Won ($240,000), in addition to 200M Won fines from previous years. There have been only a handful of charges dismissed or convictions overturned on appeal. Mr. Park Yong-Sung was released September 9 after just 20 days of a 40-day sentence for refusing to pay fines. 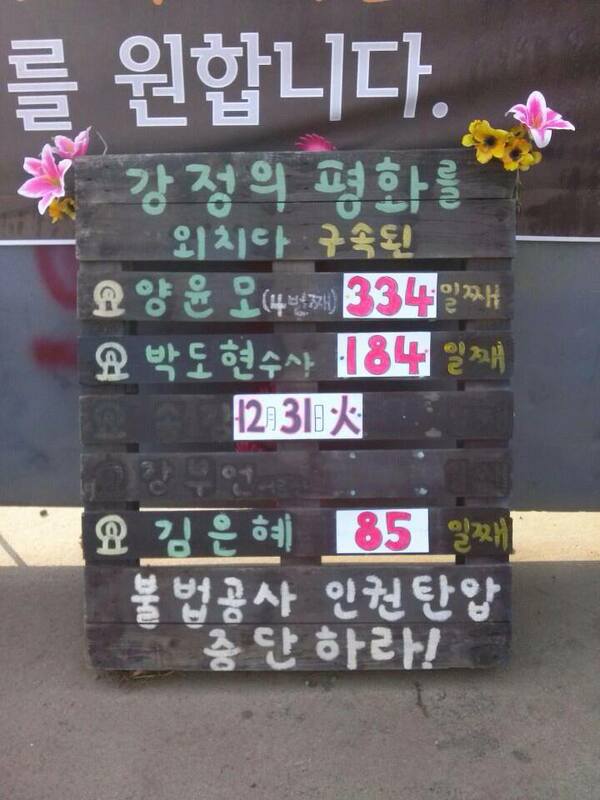 After 158 days in Jeju Prison, Mr. Kim Young-Jae was released on September 16, although his prosecution continues. His prison letter to the Nuclear Resister, translated by the Gangjeong International Team, is below. Mr. Lee Kwang-Won refused to pay his fine for a seven-hour sit-in atop a cement mixer in May, 2012, and instead served 40 days in jail in Seoul from September 28 to November 6. He is the fifth resister to refuse fines and go to jail. As more appeals are denied, it is expected that more resisters will choose jail over payment of fines. On October 7, village elder Mr. Kang Bu-Eun, 72, and Kim Eun-Hye, 23, a woman from the mainland who visited in the spring of 2012 to support the struggle and never left, were both taken from court to serve six and eight-month prison sentences, respectively. Both were accused of violence against police, and convicted of obstructing government affairs. Additional charges were included in the conviction of Kang, a quiet man who told the court he could never have imagined eating a prison meal. Then he witnessed the government force construction over the objection of Gangjeong villagers and exploit the division between the minority who support the project and the large majority opposed. Kang is known not to retreat from police when they attack, and his lawyer later acknowledged he threw a small stone that did not strike any of the police who had surrounded him. Many villagers signed a petition asking to be jailed in Kang’s place, so he could return to caring for his ailing wife. Kang’s bail application was rejected in November, but on December 5 the appeals court reduced his sentence to one year of probation and he was released, having served 59 days. The only evidence against Kim Eun-Hye was the verbal testimony of a mainland policewoman laid up for 12 weeks after Kim allegedly kicked her in October 2012 as police encircled and arrested Kim at the construction site. Testimony from police at the scene was contradictory, and the judge said that despite the lack of any clear evidence, it all seemed like something that could have happened. Kim vehemently denied striking anyone at the demonstration. During the same period, Kim herself was nearly knocked unconscious and treated for a minor concussion after her head hit the ground when police dragged her carelessly away from the gate. She remains in prison. Catholic Sr. Stella Soh Hee-sook, who helps to coordinate the daily mass, was brought to court on similar assault charges in mid-November. She is the first nun to be indicted in 200 years of Korean Catholic history, because another policewoman claimed an injury while clearing Catholic activists off the road. Sr. Soh testified to her own injuries from police. For reasons of health, Soh also moved to have her trial continued in Seoul, closer to her home. The Gangjeong Human Rights Committee held a press conference outside court on November 21, when an unprecedented 67 protest cases were on the docket. They called for a formal reprimand of the judge who would not consider evidence favorable to the jailed Save Our Seas activists Dr. Song Kang-Ho and Br. Park Do-Hyun, and demanded human rights education for local court judges who violate their duty by presuming protesters are guilty. On November 27, the court granted bail to Dr. Song and Br. Park. Both refused to post bail as the court decision seemed intentionally late and would not permit their opposition activity. Because Song was jailed for two weeks in 2011, and another six months in 2012, people urged him to accept bail. Some paid it without his knowledge and he was released two days later, after 151 days in jail. Korean film critic and four-time peace prisoner Mr. Yang Yoon-Mo will complete the first year of his 18-month sentence on February 1. For more information, follow the news in English at savejejunow.org. Monthly issues of the English-language Gangjeong Village Story, published by the Gangjeong Village Association, are posted there and include regular court and prison updates. Letters of support should be individually addressed to Mr. Yang Yoon-Mo, Prisoner No. 301; Mr. Park Do-Hyun, Prisoner No. 535; and Ms. Kim Eun-Hye, Prisoner No. 12; all at: Jeju Prison, 161, Ora-2 dong, Jeju-si, Jeju-do, the Peace Island, Korea.